Order up! Best get this hot plate of short order Flapjack Digital yumminess down the gullets of some very impatient truckers on their way through the sunshine state of Florida. That happens to be where our short order cook specialist Camouflage hides out in dirty diners that only dish out the most delicious and greasy beats. Stop in to one of these roadside delights and peep the new “Chew The Groove EP”. The first spit on the griddle is as smooth as the grease it’s cooked in. “Down” is a deep chord and bass driven plate that will rumble the guts of even the heartiest of dance floors. It’s smooth beats work so nicely with some serious sub bass that is so hot that it can fry an egg inside your fridge. To compliment this blue plate special is the Glasgow twist “Down (That Peruvian Boy Remix)”. That Peruvian Boy stops by to put his spin on this short order aural explosiveness. Take a handful of Hodges style beats, sautee it with some fresh Todd Edwards sample based grooves, and you have this production masters recipe for a dance floor feast. Nothing short of amazing on the taste buds as well as the ear buds. Warm your spirits with a huge house anthem swill of this freshly squeezed “Unite”. Just as the title says, this bit o’ honey will unite everyone on dance floor or in the bathroom. Either way there is going to be some downright nastiness going on. Be sure to wash your hands after every use. “Nothing To Lose” is what you will have when you grab up a face full of this cut. It might hurt going in a bit, but it won’t hurt coming out if you know what I mean….especially coming out of a huge sound system in front of a packed dance floor. There is some tasty bass in this tune that will fill hearts and bellies of all who get a taste. So next time you are on the road, stop by this roadside stand of short order excellence and grab a copy of FLAPD23: Camouflage – “Chew The Groove EP”. 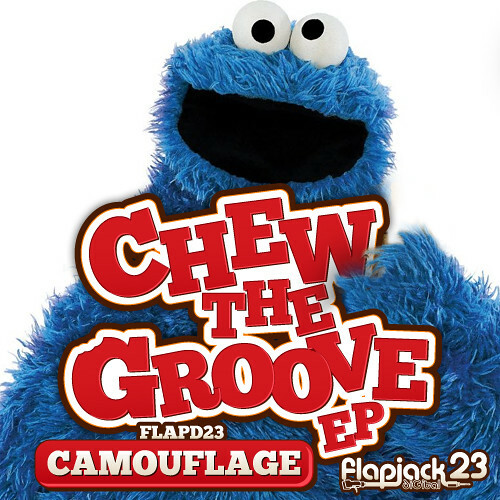 Posted in Camouflage, Flapjack Records, Frankie J on May 31, 2011 by savoyproductions. ← FLAPD22: Flapjack Records Presents – “Brunch” OUT NOW DIGITALLY!! !